Hempstead on Long Island will officially dedicate the monument Monday, the 16th anniversary of the attacks. POINT LOOKOUT, N.Y. — A Long Island beach where people gathered and watched in horror as the distant World Trade Center towers collapsed on Sept. 11, 2001, is the site of the latest memorial to victims of the terror attacks and among a growing number that honor people who died of illnesses years after participating in the rescue and recovery effort. The monument, built by the town of Hempstead near the Atlantic Ocean on Long Island’s south shore, features a twisted, 30-foot-tall beam of Trade Center steel, an elevated walkway and granite plaques engraved with the names of the nearly 3,000 people who died in the attacks. A separate plaque will have the names of 582 police officers, firefighters, construction workers, cleanup volunteers and others who spent time in the rubble of the World Trade Center in the days or months after the attacks and, years later, died of a variety of causes that they, their families or their doctors suspected were linked to toxic ash and smoke at the site. There will be room to add more names. Hempstead will officially dedicate its $1.3 million memorial at a service Monday, the 16th anniversary of the attacks. It joins a short but growing list of similar memorials recognizing people who fell ill after participating in the rescue and recovery operation. In May, officials at the National September 11 Memorial & Museum announced plans to set aside a commemorative space at the World Trade Center to honor rescue and recovery workers. New York’s police and fire departments also have memorials for personnel who have died of illnesses since Sept. 11. 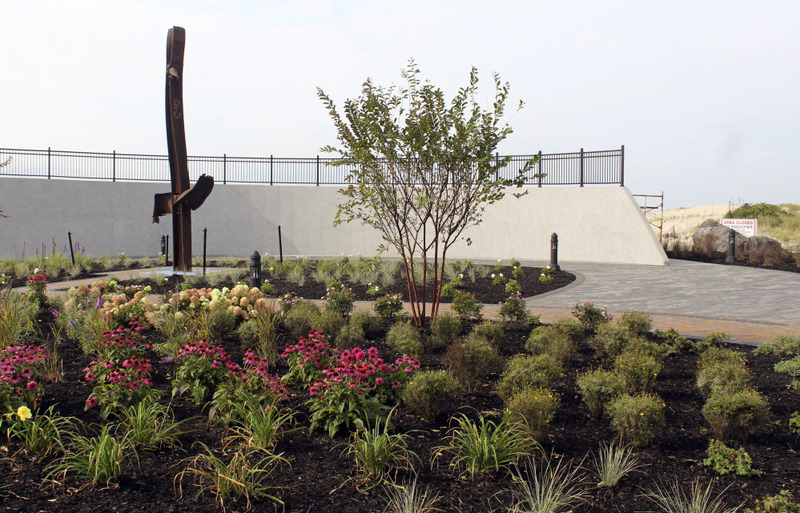 A 9/11 memorial in Staten Island recently added a plaque with the names of residents there who have died of illnesses. Feal’s charitable organization also maintains a memorial wall to 9/11 responders in Nesconset, New York. Researchers continue to study the long-term health impact on people exposed to sooty air at the Trade Center site. Determining how many people had serious illnesses directly linked to that exposure is a challenge, especially because many of the people involved are now of an age where health problems, like cancer, are common. Roughly 30,000 people have applied to the government compensation fund for people with illnesses they think might be related to 9/11. Officials overseeing the fund still are reviewing those claims but have so far awarded $3 billion. About 2,700 of the 17,400 people whose claims have been approved have cancer. Through the end of August, 144 of the approved claims involved someone who died of an illness that made them eligible for compensation. That doesn’t mean the government has concluded that their illness was definitely caused by toxins unleashed on 9/11. The program was designed to cover anyone who could show they were exposed to World Trade Center smoke, dust and ash and was subsequently diagnosed with an illness that, at least theoretically, might be caused by some of the chemicals present at the site. Hempstead officials said their criteria for inclusion on their memorial mirrored rules set by Feal for a similar list of dead that he maintains. The east side of the park features a pear tree grown from a seedling from the so-called “Survivor Tree” that lived through the destruction at ground zero.